Start your own popular social video bookmark website with ease. This full featured php Video Bookmark Script is very easy to install and use. Video Bookmark sites are very popular, they receive high traffic and at this time they are very rare. Social online video sharing is the future of the internet market. So now should be the time for you to run your own website in this new high revenue niche. This social video bookmarking script is not only a simple bookmark script like others, it does also support video bookmarking and video embedding for your users on your site. Through the video comment feature and user profile page including user avatar it is also a great community site. The Video Bookmark Script would be a good choice to start a niche site which collects all links and videos for this special niche. You will get a high revenue with this script, through affiliate marketing, Google Adsense advertising and direct ad space selling. 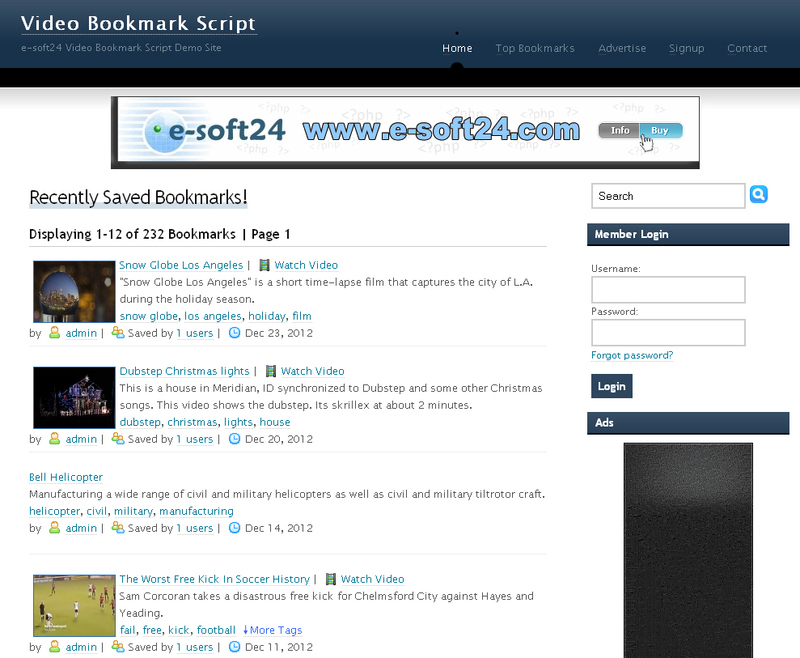 - Registered users can add text bookmarks or video bookmarks through an embed code. - Ajax video comment feature. - The first (super) user can delete comments. - Bookmark mass import function. - Registered users can add existing bookmarks by one simple click. - Registered users can upload a user avatar. - No big hosting space and not a lot of bandwidth required. - Low costs to run this site, because the videos will be only embeded not hosted on your site. - Hand coded script, md5 encoded user and admin passwords, designed under the newest security aspects and fast bug fixing. - Separately disable/enable user, text bookmark and video bookmark approval requirement. - Easily customize the cloud tags. Please note: This is the super user, which is able to delete comments. To test the script with a "normal" user you are free to register an account.